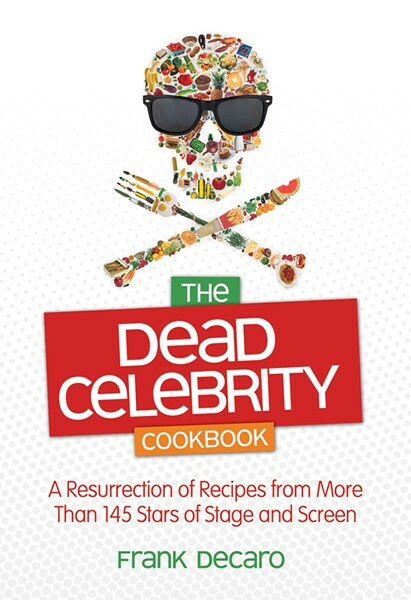 by Frank DeCaro -- Health Communications Inc.
Let's get this straight -- anytime somebody puts together a collection of recipes from dead celebrities, I'm in. The trifecta of food, gossip and pop culture nostalgia is too much for me to resist. Daily Show film critic Frank DeCaro shares the spoils of his extensive research -- through what must have been an Alexandrian library of vintage magazines, cookbooks and ephemera -- with real joy and nerdy enthusiasm. He notes in his introduction how celebrity recipes once provided a glimpse into the stars' private lives, a quaint notion in the era of TMZ and the Kardashians. Some of the recipes flesh out what we already know about our favorite icons, like Eva Gabor's Hungarian goulash, Eartha Kitt's saucy chicken wings and Dean Martin's "Bourbon and Burgers" (beef, salt and four shots of bourbon to be downed on the spot). It's easy enough to picture Gilda Radner turning out a homey apple cake, or Truman Capote tossing a decadent bowl of fettuccine with cream and egg yolks. Other entries surprise, like Patrick Swayze's chicken pot pie and Telly Savalas' butter cookies. Who knew? And Joan Crawford's poached salmon seems uncharacteristically subdued. As for looks, the book has a great personality. A handful of publicity stills and some uninspired illustrations fill in the spaces, but some kitschy retro photos might have made this book more coffee-table-worthy. It is, after all, a conversation piece, and if you serve John Wayne's casserole, your guests will want to see where you got the recipe. The book is broken down into thematic chapters, some of which suggest spirited theme parties like "All-Day TV Tray" and "An All Night Oscar Buffet." There are chapters for musicians, comics and TV moms and dads. The original cast of Batman gets its own section, as does Star Trek. Not every star is a chef, and DeCaro kindly offers some substitutions and modifications to recipes like Lucille Ball's quasi-Asian sautee, which I was disappointed to discover she called "Chinkee Goodee." Et tu, Lucy? DeCaro dishes on his subjects with wit and affection. We're served food-related anecdotes and the occasional gossip tidbit in brief bios. Of Michael Jackson he says simply, "Before he was weird, he was adorable," marveling at the singer's ability to shine in a movie as bad as "The Wiz." There is also plenty of gay camp throughout. (How else to approach Liberace's sticky buns and Rock Hudson's cannoli?) Some of the recipes are as goofy as the premise of the book, but DeCaro's contagious excitement and admiration for stars big and small makes us want to join the party.